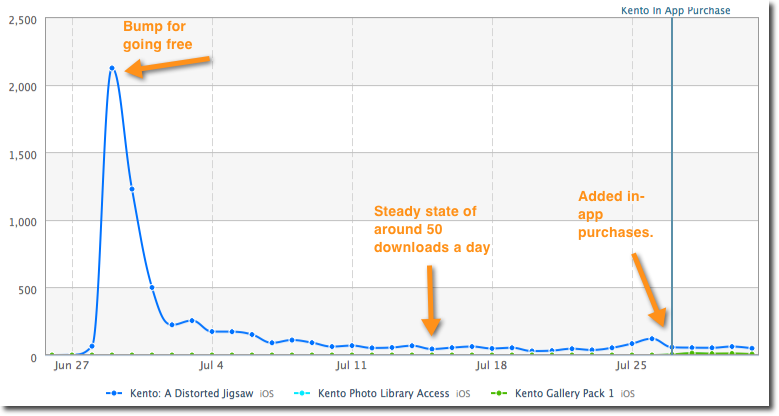 Kento is Five Lakes Studio's 6th iOS app, but it is our first original game title. It's a little scary releasing a unique unknown title. So the very first decision we made was to get something to market quickly to learn if we had a good idea or a stinker. Ken did most of the initial work on Kento, and he spent about 3 months working nights and weekends. I came in during the last month to help do some final UI and polish, but given there are only two of us and we both have day jobs we where really happy getting the first release ready that quickly. 1.0 Ships: What will happen? Release 1.0 shipped on May 4th. We only had about 18 puzzles and our idea was to give Kento away for free to gather feedback. We had a great launch with over 1,000 downloads the first day. We didn't do any press or marketing, we just let the AppStore do what it does. Assuming people actually downloaded the app, we where expecting to get hammered for not having enough puzzles. When we did something similar for one of our other games called Picross HD, we got hammered with 1 and 2 star ratings by people saying we didn't have enough puzzles. This time, people did ask for more puzzles but they were actually giving us 5 star reviews! In usual fashion for the AppStore when we fell off the main page for our category, our downloads dropped rapidly. And after a few more days the downloads started to drop off again. However, we had the data we needed. We liked Kento and it looked like others did as well. Kento was a keeper, and we needed to get started on the next version. Even though we where building the next version, I wasn't done with the experiment. I decided to take the price to 99 cents, and you can guess what happened. The sales hit the floor hard, but that's what an experiment is for. This told us that we really needed to make the base application free, but we still wanted to monetize the title. We haven't had much success with the ad model in the past, thus the next obvious answer was to do in-app purchases. While we where building the new features, our downloads dropped off significantly. I started to doubt that we could really gain traction on our own game title. So I made Kento Free on June 28th. This gave us really good results with over 2000 downloads in the first day, eventually leading to a steady state of about 50 downloads a day. My doubts were greatly reduced! During this period of time, we continued to get great reviews and feedback. We ended up a solid 5 star rating for awhile. That was some nice motivation leading up to our 1.1 release on July 28th. 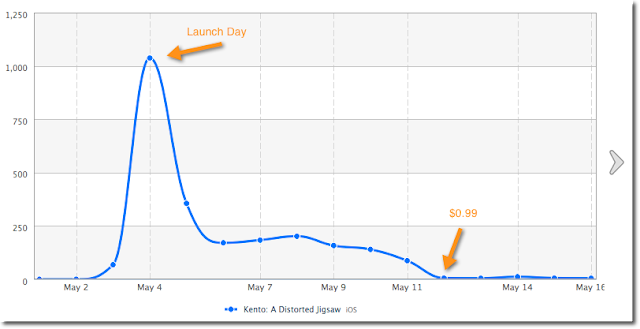 The in app purchases where generating modest revenue. The App was free, and we where making about $45 a week on Kento through in-app purchases. Another experiment we wanted to conduct was to see if people would prefer buying picture puzzles made by us or if they wanted to use their own photos. We got a fair number of user requests for the latter. Turns out picture puzzles (green), made by us, sell much better than user's photos (light blue). We quickly followed up 1.1 with a 1.2 release to fix a couple of issues. In particular, we didn't display the prices of the in-app purchases within the App's UI thus our user's couldn't see what they were buying. Oops!!! 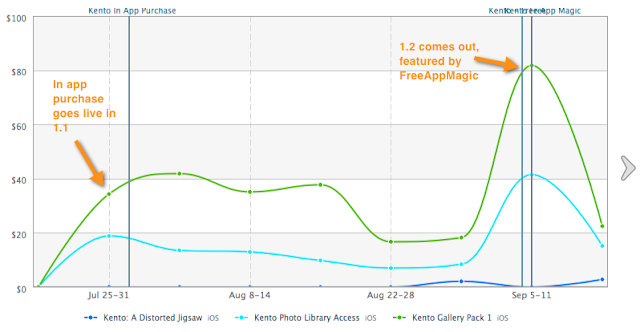 We got a little lucky when we released 1.2, we were contacted by FreeAppMagic. They liked our App and offered to feature Kento for free. WOOT!!! And I must say they did a great job. We shot up within the top 50 in our category for a few days. That's the nice sales spike in September. Changed name to "Kento: A Distorted Jigsaw"
Increased the price of the 1.1 puzzle packs by $1.00. We wanted to test if 50 piece puzzle packs would sell better then 100 piece puzzle packs. So far the 100 puzzle packs are outselling the 50 piece packs. We got a good amount of people upgrading who decided to buy the 1.1 version's 100 piece puzzle pack when they upgraded to version 1.3. We think this is because we updated our in-app store and added the ability to preview the puzzle packs before purchasing. We read an article by Tim Cascio about naming an App and taking advantage of keywords in the App's name on the AppStore. Names will be read/seen be people scanning though apps and hopefully draw their interest. So we tried that with this release. Too early to tell what effect that will have or if we did a good job on the new name. We are working with A2A3 of Ann Arbor in the fight against Lou Gehrig’s disease. Six women are going to be swimming the English Channel in July 2012. We are donating our time to make a special version of Kento that will promote the event and hopefully help with collecting donations. We are working on a project called Kento:Live that will allow puzzles to be downloaded from the web. We would like to work with photo studios, local government municipalities, or anyone who would like to promote their work/community with a mobile app. Wow if you made it this far, I want to say thank you and I hope you enjoyed the journey. I invite you to try out any of our games at www.fivelakesstudio.com, and be sure to give Kento a try. Also please let us know what you think of this post or any of our games. You can follow me on Twitter at @fivelakesstudio or send me an e-mail at tcunning@fivelakesstudio.com. Thanks for the post and the transparency. It's always nice to see number and spikes with notations.